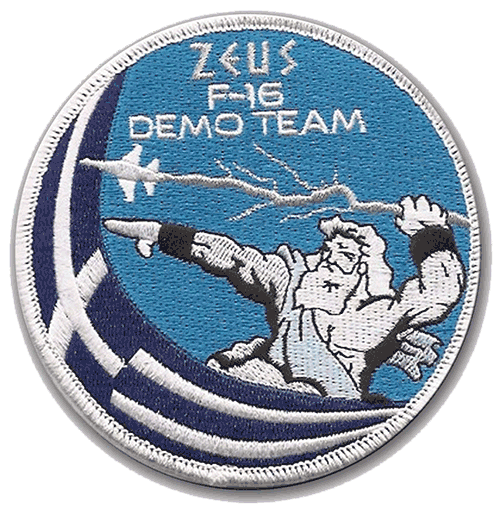 The Hellenic Air Force's F-16 solo demo team carries the name "Zeus", the father of the Olympian Gods of Greek mythology. The team utilizes a single F-16C Block 52+ as the display aircraft and was the first and only F-16 demo flying with conformal fuel tanks (CFTs) in Europe. The effort to create an HAF F-16 demo team began in 2009 when the Greek crew was trained by the F-16 Viper West demo team of the USAF. Two pilots of the 115 Combat Wing, Captains Emmanuel Karahalios from 340 Sqn and Dimitrios Kontoulis from 343 Sqn, were selected to become the first pilots. After almost a year, on 7 November 2010, the HAF F-16 Demo Team flew its first official air show at Tanagra Air Base. During the initial years there was no one particular aircraft for the displays. Later the F-16C s/n 537 which belonged to 340 Sqn was chosen as the demo aircraft and it initially received special markings only on its CFTs. In 2015 F-16C s/n 523 also belonging to 340 Sqn became the dedicated demo aircraft and received a full Zeus paintjob only a few days before RIAT 2015, where it made its first airshow appearance.